Structural dynamics is a discipline concerned with the behaviour of structures subjected to dynamic loading. 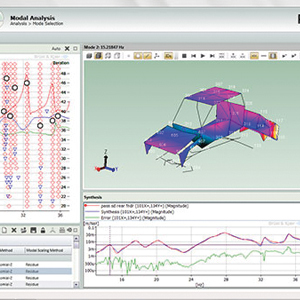 BK Connect solutions for analysis of structural dynamics are Operating Deflection Shapes Analysis, Classical Modal Analysis, Operational Modal Analysis, Test-FEA Integration and Shock Response Analysis. Classical Modal Analysis – Classical Modal Analysis ranges from simple mobility tests with impact hammers to multi-shaker testing of large and complex structures with hundreds of response accelerometers. Brüel & Kjær’s modal solutions are expandable and can grow with your requirements. Operational Modal Analysis – Based on measuring only the output of a structure and using the ambient and operating forces as unmeasured input. It is used for modal identification under actual operating conditions and in situations where it is difficult to control an artificial excitation of the structure. Test-FEA Integration – Type 8722 – The Finite Element interfaces enable you to import large FE models into BK Connect Reflex Modal Analysis and BK Connect Reflex Correlation Analysis. The FE models can be imported as UFF files or from FEA programs like NASTRAN®, ANSYS® and ABAQUS®. Shock Response Analysis – Type 8730 – Type 8730 computes the shock response spectrum (SRS) from transients in the time domain. The aim of the SRS calculation is to convert motion input to a set of single degree of freedom (SDOF) damped oscillator responses calculated in the time domain.